ASUS has announced the latest iteration of its PadFone known as PadFone Infinity, which is essentially a smartphone that can be tucked into a tablet (the tablet being part of the product) at the MWC 2013 according to a company press release. This is the third version of the device after the PadFone and PadFone 2 and it also runs Android, like the predecessors. The new Android 4.2 (Jelly Bean) device (only the smartphone part) sports a 5" Super IPS+ capacitive multi-touch display with 1080p resolution (pixel dimensions of 1920x1080), which is a leap over the 4.7" 720p screen of the PadFone 2. The smartphone is powered by a quad-core 1.7 GHz Snapdragon 600 CPU with 2 GB of RAM and boasts of 64 GB of storage. We must remind you here, only tablets are known to have such kind of storage, with a few recently pushing further beyond upto 128 GB (top-end devices like the iPad). Like its predecessors, the PadFone Infinity is not just a smartphone, but also includes a tablet that works as a docking station known as the Infinity Station. Sharing the phone's CPU, RAM and storage, it sports a 10.1" 1080p Super IPS+ capacitive multi-touch screen. While the smartphone has its own 2400 mAh battery and can work independently of the tablet, there is also a 5000 mAh battery in the tablet that is used when the device is used in the tablet mode. This allows for a claimed 19 hours talk time on 2G. Additionally, it features a 13 MP camera capable of recording 1080p video while simultaneously capturing up to 100 snaps at 8 frames per second, a feat not achieved even by most cameras currently. The camera with an F/2.0 5-element lens has a dedicated imaging processor to take care of this task. 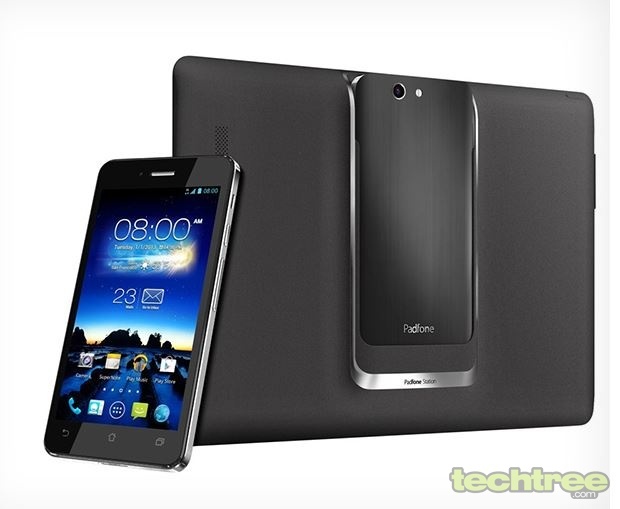 Currently, ASUS has only announced the UK pricing of the PadFone Infinity, saying it will set you back by £800 (~Rs 66,000). Considering that the tablet portion cannot work in standalone mode, that may seem to be a bit too much, depending on what you expect from your device.